I am a teacher. That is what I tell people when they ask me what I do. While I may not be in a classroom at this moment, the educator in me is constantly working. Lesson plan ideas, classroom management concepts, and fun facts are always running through my mind. Unfortunately, the world of education has changed a lot over the last 5-10 years. The Race to the Top funding and the push for Common Core Curriculum has caused a dramatic shift in what classroom time looks like. Children in New York State and around the country are constantly getting ready for one test or another, taking one of what seems like a million tests, or being stressed about what their test results may mean for their schools/teachers. The reality is that your children and mine are paying the price. Creative and authentic learning environments are a thing of the past. We are teaching to the tests. Kids are becoming little robots that are taught how to highlight key phrases, pull apart a topic, and answer questions that may not even have a correct choice. I have a lot more to say on this topic, but right now I am biting my tongue a bit. Rather than rant and rave here, I am working with parents and teachers to get the word out. I want our voices to be heard. Thanks to this, my family will be joining others on June 8 at the Empire State Plaza for the One Voice United Rally Together. Why rally? Here is a video from Peter DeWitt on the NYSUT website that answers the question. As an educator, tax payer, and most importantly a parent I will be there with my entire family showing my boys that I will fight for their right to the education that they deserve. My children are more than a number. My 4th grader should not lose eight days to the ELA, Math, and Science tests, plus other hours for benchmark exams, and countless days spent preparing for these high stakes test. I should not have to hear my KINDERGARTENER come home worried about a test that he took on a computer. He should not fear tests and have to worry about this as he starts out his academic journey. His focus should be on reading, writing, learning math concepts, making friends, and enjoying school. Sad to say, his teachers are not to blame. New York State needs to wake up, see what they are doing to our children and stop the insanity. 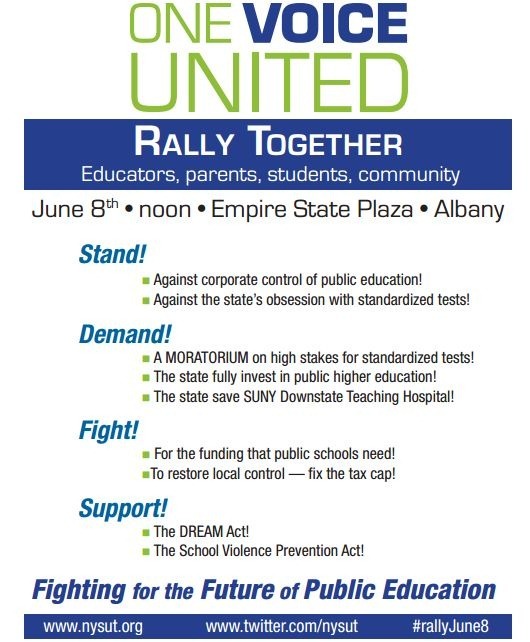 For more information about the rally on June 8, please head to the information page from NYSUT. 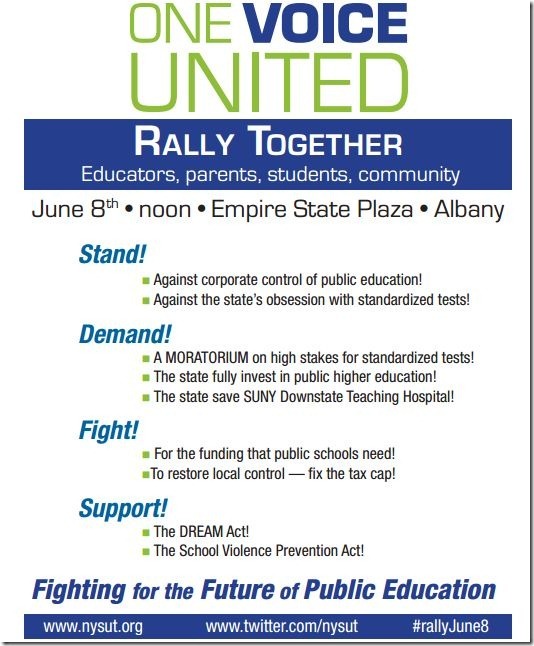 I will leave you with this PDF from NYSUT about the rally that you can download and share with others here. I urge more people from throughout New York to make a trip to Albany in a little over two weeks to teach your children a valuable lesson. Thanks for this post. I’m from the uk but I think exactly the same thing is happening here. I have friends who are teachers and say the same as you, that the curriculum is stifling and not allowing for real independent thought. Also many children here in London are from other countries with foreign language parents and are not learning to read and write properly as there is not time to give them the specialist teaching they need, and if you miss it the curriculum does not allow you to return to this topic. Good luck in your rally and cause!